Uncertainty is a part of life and though we have many ways of convincing ourselves otherwise, few things are certain. So learning to be a bit more comfortable with uncertainty is would probably benefit us all. The better we are able to live with uncertainty the less we waste time and energy on trying to influence things that are outside our control. A few years ago I was involved in a study where we asked managers to report on what they found most difficult to deal with at work and in their relationships. It was no surprise that what they found hardest to tackle was interpersonal conflict. What was a surprise was the reason: managers don’t like dealing with conflict or tension with others because they are unsure about how to go about it. Nobody likes dealing with difficult relationships and we assumed that this was because they were afraid or embarrassed. But what managers actually felt was uncertainty, about what to say and how to say it. And this uncertainty meant that they often held back from dealing with interpersonal conflict. Managers don’t like facing situations they cannot ‘fix’. Our research tells us that managers feel helpless being unable to offer a solution, so they tend to avoid dealing with the complexities of relationship issues. This explains why many organisations adopt an ostrich position when faced with disputes between staff, but what can be done about it? When we looked closely at the results of our study we realised that these two points – uncertainty and the manager as ‘fixer’ – are linked. Managers don’t like uncertainty (who does), and dealing with interpersonal conflict between colleagues means accepting a high degree of uncertainty. This is what psychologists call the capacity to deal with uncertainty. We each respond to uncertainty (ambiguity) in information and behaviour differently. Those who can approach dubious or unclear situations in a neutral and open way often tend to do better than those who don’t. This correlates with creativity, leadership style, attitudes to risk, acceptance of diversity, psychological resilience and even lifestyle. Unsurprisingly then, the greater a person’s tolerance for ambiguity the better they tend to do in many workplace situations. This is particularly important for managers, but useful for us all to remember in our own personal development. In contrast, a low tolerance for ambiguity means the inability to accept uncertainty, which in turn makes the person aversive to risk and uncomfortable with change or situations where they cannot predict the outcome. Though Freud said “Neurosis is the inability to tolerate ambiguity”, and while authoritarian or ‘control-freak’ behaviour can be irritating to others, there are situations where a low tolerance for ambiguity is a positive benefit; it is a positive attribute in jobs where uncertainty must be eliminated. Think of airline pilots or surgeons for example. In contexts where we need to reduce risk and uncertainty a low tolerance for ambiguity is a good thing. In dealing with workplace disputes though, it probably isn’t. So what does this mean to a manager dealing with a dispute at work? Conflict, like so much in life, is an uncertain business. As any mediator will tell you, we can never predict outcome when it comes to calming conflict. Professional conflict resolvers are trained to live with uncertainty, and to help the disputants construct their own way out of their dispute. We are not expected to fix it, and even if we could any settlement reached this way would be unlikely to last without supervision. Whatever steps a manager may take to help two people in dispute, it must be ‘hands-off’ to allow them the time and space to sort out their difficulties. So managers must give support and guidance, but they must give up any attempts at being directive or authoritarian. After all the dispute was started by the two people concerned and so it is up to them to fix it. (This is not the case with bullying or harassment, where an employer must take positive steps to correct the problem while offering support to both parties. See my Guide to Bullying). In summary, the better we can live with uncertainty in many situations the better our sense of well-being and the less we waste time and energy on trying to influence things that are outside our control. We are also better at listening and observing when our minds are open to possibilities rather than closed and trying to ensure certainties. It is useful for us all to be aware of this, to identify patterns in ourselves, and to develop habits that enable us to be happier and more productive. Developing greater tolerance for uncertainty is not difficult, but developing anything new in ourselves it needs commitment and regular practice. OK, so maybe ‘love’ is a bit strong. Nevertheless, people who make good leaders very often seem to seek out uncertainty, they are more the comfortable with it, they actually welcome it! 1) Do a reality check. Make a list of the things in life you really can control. It’ll be a very short list, and it’ll draw your attention to situations (and people), you have been trying to control without realising it. Then you can stop trying, and start practising feeling comfortable with being unable to do anything about, say, someone else’s opinion or your employer’s latest policy decision. Remember that you can influence most things about as much as you can influence the weather. When we think we know something we have already formed an idea about what to expect. Without realising it, we then start to look for information to support what we ‘know’. We miss new information because we filter it out. Not knowing requires opening of the mind so that we can see, hear and experience things more completely, without our filters getting in the way. One way we try to protect ourselves from uncertainty is by developing unthinking habits and routines. Exploring uncertainty by doing something new helps train the mind to be more flexible and accepting. Start with the small habits – what you eat fro breakfast, how you greet your colleagues – and try doing something differently each day. We live and experience everything through the present. Mindfulness Is based on developing moment to moment awareness of our experience, without judgment., so that we can fully appreciate what we are thinking, feeling and doing at any moment. 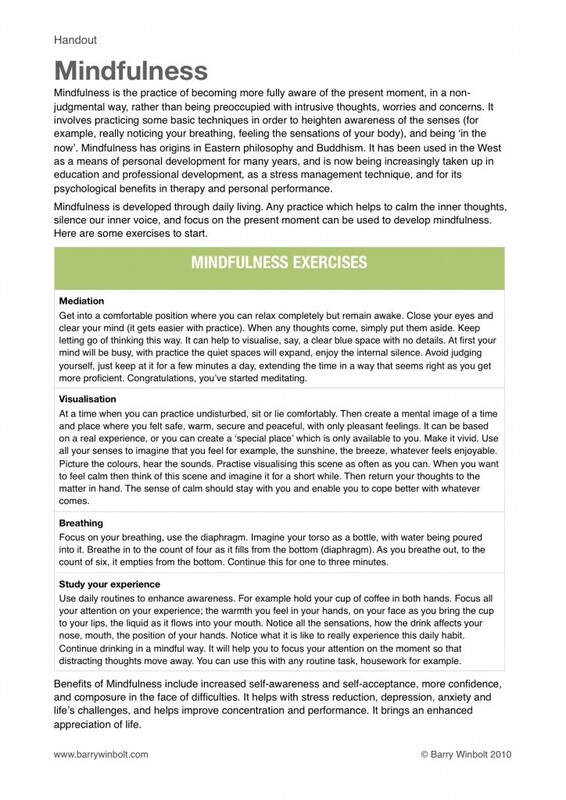 There are many on-line resources for learning about Mindfulness for example the Centre For Mindfulness Research at Bangor University. The key to functioning better despite uncertainty is to help your mind learn some new habits. Use these exercises to start consciously choosing how to think. People who do best at this are really curious about what’ll happen when they try something new. When they think of uncertainty they see opportunity. They may be anxious too, but the excitement of possibility means that their anxiety doesn’t get the upper hand.